Our review of the Philips Norelco Nose Trimmer 5100 will provide you with the information you need to determine if it is the right product for you. In this article, you will find detailed information about the design of the product, how it works, its top features, what accessories you’ll get with it, and lists of what we like about it and any changes we’d like to see. You’ll also get some opinions directly from people that use the product. We’ll also include a brief summary of our opinion on the Philips Norelco Nose Trimmer 5100 and invite you to share your thoughts on it. What Was the Philips Norelco Nose Trimmer 5100 Designed for? One of the first things we noticed about the Philips Norelco Nose Trimmer 5100 was its versatility. It should work well for you if you need to trim your nose or ear hair. Thanks to the extra brushes you get with your purchase, you can shape your eyebrows using the Philips Norelco Nose Trimmer 5100 without any trouble. We like that you can get the most out of this product right from the box without any special tools. All in all, you should be able to get a fast, effective trim with this unit. You will find a brief list of some of our favorite Philips Norelco Nose Trimmer 5100 features or functions in this section. You may encounter other features you like as you use the device. The Philips Norelco Nose Trimmer 5100 has a unique trimming angle that helps you reach all parts of the face that you want to trim. It does not pull out your hair. You can choose from one of several brushes or a combination of brushes to get the look you desire. The grip has a particular texture that makes the Philips Norelco Nose Trimmer 5100 ergonomic and easy for you to control. This item is very affordable. It is water-resistant in case you need to use it in wet shaving conditions. The manufacturer says you should never need to use oil on the Philips Norelco Nose Trimmer 5100. It includes a cleaning brush. This brush should be all you need to maintain the item. The foil guard is thin and lightweight but will still protect your skin from irritation. It has a two-year warranty and a limited money-back guarantee. A Philips Norelco Nose Trimmer 5100. We’ve compiled a short list of the top things we like about the Philips Norelco Nose Trimmer 5100. 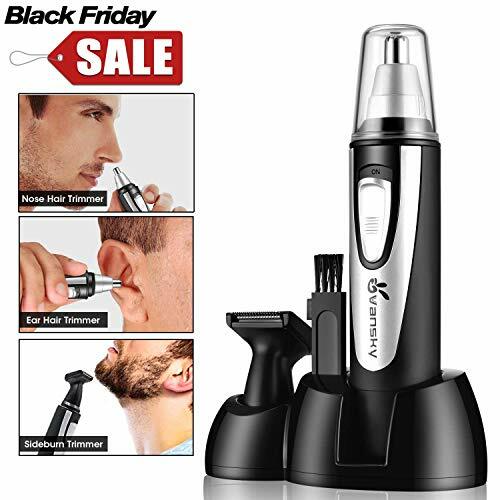 While you may find other things to like about this product, these are the things that we think make it a worthy nose trimmer option. Unlike some comparable items in the same category, the Philips Norelco Nose Trimmer 5100 does not seem to pull or yank at the nose hair. This feature is probably a big plus for anyone who needs to trim their nose hair regularly in order to maintain a clean look or a particular style of facial hair. Note that this trimmer is effective on face and neck hair as well, and it should not pull at hair in those areas. You get your choice of brushes to use with the Philips Norelco Nose Trimmer 5100. It comes with a beard comb, a regular brush, a cleaning brush, and a detail trimmer. While the cleaning brush is there simply to help you maintain the product, you can use the other ones to get the precise look you want to achieve. While no extras might seem like a bad thing at first, we mean to say that you do not need to purchase any extra parts or accessories to get the most out of this unit. The Philips Norelco Nose Trimmer 5100 comes with everything you need to do the job correctly the first time. It was difficult to find anything dislike here. Nonetheless, no Philips Norelco Nose Trimmer 5100 review would be complete without mentioning a few things we think the company could improve. While most tools have some kind of learning curve, you may find the curve for the Philips Norelco Nose Trimmer 5100 to be a bit steep. The learning curve can vary from user to user. However, you should know that it might take some time for you to get used to the angle of the device. This means your first trim might not be as perfect as you’d like it to be. While we like that the Philips Norelco Nose Trimmer 5100 doesn’t pull your hair, it can be difficult to trim all of your areas efficiently. You may need to make a few passes over some parts of your nose or face to trim all the hair to the degree you desire. Most users seem to appreciate that this unit does not have to sacrifice performance in one area for effectiveness. In most cases, it seems to trim nose, ear, and eyebrow hair equally well without any problems. Although it does have a learning curve, many users claim that they can move this trimmer across the face both quickly and aggressively without any accidental cuts or other issues. In rare cases, some users complain that the trimmer quits working on them. Some even say they received one or more replacements that quit working in the same fashion after only a few uses. While you may receive a defective item, it is more likely that you can simply remove the trimmer head. Therefore, always check to make sure the pin is working and move the plastic piece back and forth to loosen it. If you need a new trimmer that can deal with different types of hairy areas across your face, the Philips Norelco Nose Trimmer 5100 might be the best product for you. Anyone who needs a clean trim job to keep their facial hair in line and looking good may benefit from this product. Please share your thoughts with us in the section below.